Upper left panel: There is a feedback from intestinal hyperpermeability to MODS that causes an acceleration of epithelial cell apoptosis. Intestinal hyperpermeability opens the gateway of biological protection, thereby allowing bacterial translocation, enhancing cytokine production, and ultimately inducing the systemic inflammatory response. 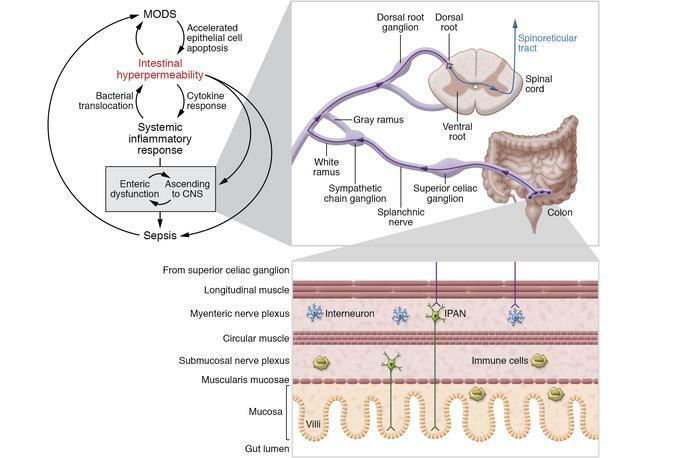 The cascade of the MODS will lead to sepsis through opening of the gateway, via intestinal hyperpermeability facilitated by enteric dysfunction and then the transfer of the local injury information to the CNS. The upper right panel shows how the colon links with the CNS, and the lower right panel shows the details of the colon from mucosa to myenteric nerve plexus. IPAN, intrinsic primary afferent neuron.